Warped boards are common. Woodworkers and builders refer to them as having crowned, meaning the board bows in the center. The warp usually results when the board dries out on one side while the other side remains moist. Carpenters typically reject warped boards if replacements are available. If there's no option, there are two methods for straightening boards: allow the wood to straighten out naturally by adding moisture and pressure or use a jointer to reshape the surface. The results are not always perfect; in most cases, it's impossible to completely straighten a warped board. Place the board on a flat surface. Place a straightedge lengthwise on the board to identify the crown. If the ends of the board do not touch the floor, flip the board over so that the bow is pointing up. Draw an X on the high point of the bow. Flip the board over so that the X is facing down. Apply enough water to the board so that it pools, encompassing the bowed portion. Allow the water to remain on the board for at least 15 minutes, then wipe it off. Place the board across one or more sawhorses, depending on its length. Stand the sawhorses end to end in single file so that the top rail forms a line. Balance the board lengthwise on that rail with the wet side facing up and the X facing down. A worktable can also serve this purpose if its length is similar to that of the warped board. Position the board as needed so that you can attach clamps at opposite ends of the sawhorses. Place a two-by-four block under the board, directly under the X mark. Sawhorses typically have solid blocks or braces on each end. Slide the sawhorses to be flush with both ends of the board -- a gap between them is OK -- to position the braces directly under the ends of the board. Hook the bottom jaw of a clamp under the brace at each end of the sawhorses and the top jaw on each end of the board. Tighten the clamps until the warp in the board reverses by at least 3/4 inch. The extra tightening allows for the board to spring back by that amount when you remove the clamps. Remove the clamps after 72 hours. Repeat the steps until the board is sufficiently straight and dry. Use the jointer if the board isn't sufficiently straight after six weeks. Set the depth of the jointer to remove 1/16 inch of material. Place the board on the bed of the jointer with the X facing up. Turn on the jointer. Grasp a push pad in your left hand. Grasp a push stick in your right hand. Place the push pad on the center of the board. Place the end of the push stick on the end of the board. Push the board across the blade using the push stick while applying moderate pressure to the board with the push pad. Don't apply enough downward pressure to bend the board. Repeat as many times as needed until the board is evenly planed or flat across the bottom. Place the board on the bed of the jointer with the X facing down. Run the board across the jointer as many times as needed until you remove the X. Using fans or heaters on the wet board will help speed the drying. Move the positions of the clamps periodically or if you notice cracks. 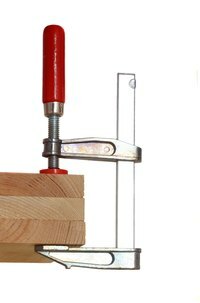 Jointers reduce board thickness depending on the degree to which the board is warped. Using a jointer to remove a severe warp may result in a board that's too thin to be of use. It's tempting to use a planer to remove a warp, but it will not work well for this purpose. Planers use intense pressure to flatten a board, but when it emerges from the machine it will be thinner but still warped.